It’s that time of year when Christmas Markets are springing up across the UK and Europe, and it’s a great opportunity to indulge in some serious shopping, do some sightseeing and immerse yourself in the seasonal spirit. Why not bring a sprinkling of continental Christmas magic back to Britain, and delight friends and family with their special, hand-picked Christmas market gifts? Plus some ubiquitous gluhwein – the seasonal tipple of choice, to keep your festive spirits high! ‘It has always been our desire to get into the festive spirit by paying a visit to one of the German Christmas markets. Having been to Berlin three years ago for a city break, and having heard from friends about how wonderful their experience was last year, it seemed the obvious choice. We started to do some research and it quickly became clear that like our city break previously, to maximise our experience, we needed to not only do our research before we went, but also come up with a daily plan/itinerary. Searching ‘Christmas markets in Berlin’ on Google, soon made us realise that there are over 80 market sites across the city, so finding one was not going to be the issue, it was more a case of narrowing down the choices. We found a useful site ‘Enjoy Berlin’, that had an online article that listed the top 5 markets to visit. After mapping where the markets were located, we soon realised that visiting these 5 markets would also allow us to visit areas of the city that we previously did not get to explore, or wanted to revisit. Now you may have heard from people’s experiences of the Christmas markets, that one market is the same as the other market, which is correct to a certain extent. They generally have a host of edible treats to be sampled whilst you pass through the stalls/ huts selling a host of Christmas gifts from glassware and lights to hand-carved wooden decorations and toys. However, there are variations to each market, making each one unique. 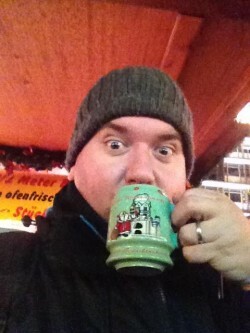 One thing that does differentiate the markets is that each market that offers Gluhwein serves it in a unique and festively-decorated mug. The stalls will charge you a €3 deposit for the mug, which you get back when you have finished warming your cockles! However , they are a good souvenir of your market visits, and no doubt they are a functional talking-point back in the UK when you’re entertaining family and friends, and using the mug will bring back the memories of a truly festive break. Berliner Weihnachtszeit am Roten Rathaus – The market is located at Alexanderplatz. The main attractions of this market were the 50 metre high Ferris Wheel and the ice skating rink that goes round the fountain. The ice skating cost €4 and a group ticket for the Ferris Wheel was €22 for four adults. 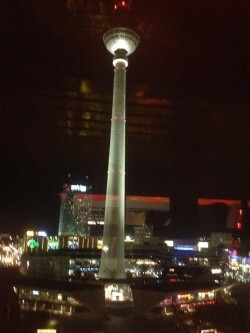 This is a great location if you also want to visit the Berlin TV tower experience. Wintertraum am Alexa (incl. fair) is on the other side of Alexanderplatz. The market is the most lively of the Top 5. If you’re into thrill-seeking and want a break from the shopping, this would be an adrenaline-fuelled option. However, I would advise that you don’t sample too much of the ubiquitous Gluhwein if you want to emerge unscathed! 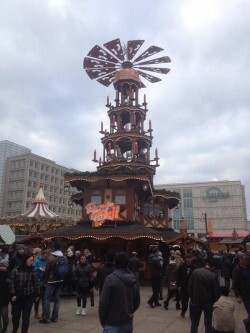 Winterwelt am Potsdamer Platz– Another great option, which cannot be ignored in a list of Christmas markets in Berlin, is Potsdamer Platz. This Christmas market is often referred to as the Winterwelt and is located directly between the immense buildings of Potsdamer Platz. One of the reason many people visit Winterwelt is the rodelbahn. After buying a ticket (1,50€) you can slide down a large snowy mountain on top of a tyre. It might sound like something which is not possible in the middle of the Berlin, but it is a great sight to see thrill-seekers of all ages hurtling down the artifiical slope, even if you’re not up for the challenge yourself. Weihnachtsmarkt am Gedachtniskirche– is in the west of Berlin and away from the central markets, however well worth a visit. There was a wide variation of stalls to browse amongst for treasures to take home, and it was one of the quieter markets. It is set around the ruined church which was preserved after the Second World War bombing had destroyed most of the building. It is known by Berliners as the Hollow Tooth. To gain a feel for the markets, the following video goes someway to show you what you can expect. 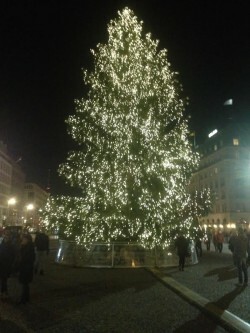 However the best way to experience the markets and all of the other attractions that beautiful Berlin has to offer is to go for yourself and take your pick from the many Christmas Markets that bustle for your attention at this time of the year. It is not very costly if you book in advance, with several low cost airlines flying to Berlin, and this kind of trip can make the perfect pre-Christmas continental weekend break. So why not follow in Mark’s footsteps and take a festive mini-break? 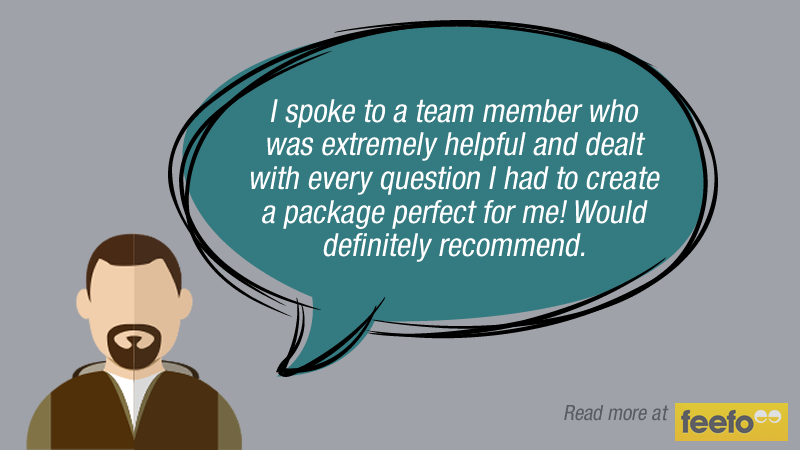 If you need travel insurance for your trip, you can get a quote here and don’t forget to ‘Like’ our Facebook Page to get 10% off our policies. You may also want to read about my trip to Germany, when I visited Cologne after Christmas last year : Enjoy Life in Cologne – and not just at Christmas!